Mercedes-Benz maker Daimler is embracing Silicon Valley management techniques in a drive to speed up decision-making, empower staff and fend off new rivals such as electric carmaker Tesla Motors. 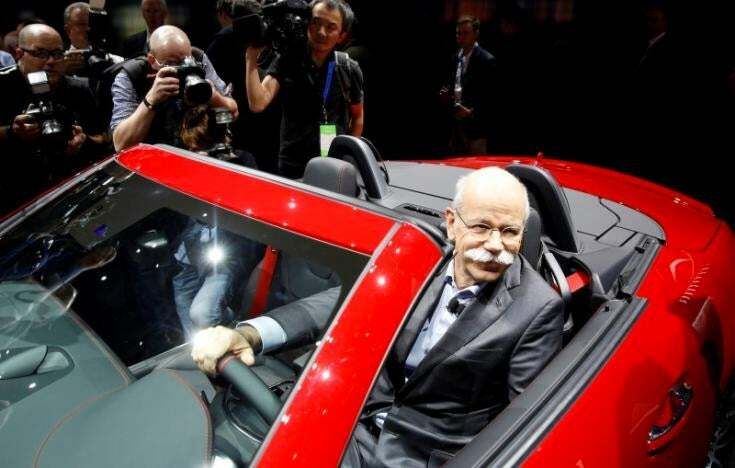 Chief Executive Dieter Zetsche is sweeping away layers of bureaucracy and encouraging a more experimental approach to new products. He has also asked 144 employees -- many of them from the rank and file -- to generate new leadership ideas, according to sources at the German luxury automaker. Outlining some of his plans in June, he likened Daimler to a rhino but said its size -- with twice Tesla's market capitalization and 20 times the number of staff -- did not mean it couldn't also be nimble and decisive. "Rhinos are large, but they are not slow," Zetsche said. Alexander Hilliger von Thile, a senior graphics and rendering manager at Mercedes-Benz research and development in North America, said Daimler was now encouraging ideas from all team members and not just the "Bereichsleiter" or department chiefs, as well as greater collaboration. "We do not want to have experts who know everything, who sit somewhere and don't talk to anybody," he told Reuters. But advances in battery technology and the success of the Tesla Model S, which last year outsold Mercedes's flagship S-Class limousine in the United States, have changed that. "We said before that if you are too early, you lose money. Now the view is if you are too late, you lose the market," the executive told Reuters, speaking on condition of anonymity. The risks associated with releasing new technologies, however, were laid bare earlier this year when Tesla shares tumbled after news that a driver of one of its cars had been killed while using "autopilot" mode, an advanced cruise control tool that other automakers have taken a more cautious approach to introducing. Daimler sources say Zetsche's reforms have been influenced by the company's dealings with Tesla when it was a shareholder, as well as techniques studied at other Silicon Valley companies. "One party (Daimler) wanted to plan and think things through. The other (Tesla) acted on a 'shoot and aim' principle correcting things as you go along," one Daimler source told Reuters, adding Tesla was often faster at implementing new technologies as a result. Another major change is to allow departments to fund an idea even if it is not clear what products will result from the spending. Having a perfect "specification sheet" used to be a precondition for investment. Daimler calls this "corporate crowdfunding" -- a technique learned during last year's Silicon Valley trip, when managers also met start-ups such as San Francisco-based La Cocina, a non-profit organization helping low-income food entrepreneurs. "They were mostly interested in the ways that our entrepreneurs brought their ideas to market, and how La Cocina, as an organization, supported that type of innovation," La Cocina director Caleb Zigas told Reuters. As much as speeding up decisions, Zetsche's reforms are focused on engaging and retaining staff. Tesla's success has given rise to a raft of rival electric carmakers, including Faraday Future, Borgward and Future Mobility Corporation, and traditional carmakers have seen several high-profile defections. "At the end of the day I get the impression that the traditional car companies, not only BMW, will not really be able to follow the pace and do the big steps which will be needed," he told Reuters, explaining his decision to move. "Tesla offered employees ownership and entrepreneurial freedom. To make changes at an established company is a bureaucratic process. Tesla's success has given executives the confidence to consider joining other start-up carmakers," she said.